A friend, posted that I there should be an app that tells you when are variety of things such as when your noodles are done, or when your girlfriend should be ready to go out, etc. Sure all phones come with timer apps, but who wants to enter numbers and be all scientific/precise, it’s much more fun to select what you want and see the numbers tick away. I’ve recently got into phone app development for a client, but the app isn’t complete yet due to it’s large scope and other staff. So this timer app seemed like a good task for me to work out and bring my first app to completion. It’s called ‘Totem Timer’, named after the university residence we met in (hey, it needed some name). 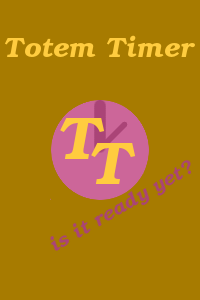 It’s currently available from the Totem Timer download page for Android, and Blackberry. I’m hoping I can get some feedback from friends that it is usable on various devices. It’s not available in the Android Market as to make a return on the fee I’d have to sell over 30 copies for 50p or find an advertiser, and I don’t think this app is worth 50p. It’s not available in Blackberry App World yet because I need to understand that & the processes a bit more. It’s not available at all for iPhone/iPad because I need a Mac and a license before I can be sure it works fine on them. The iTunes App Store is also known to be more fussy and restrictive, creating a closed market. This is what you get for paying so much for brand loyalty/lock-in, so for now I don’t care that you can’t use my apps.